Bharatanatyam is an ancient divine dance style from South India that originates from the Sadir dance form patronized by the courts of Indian kings prior to the 17th century. It is a deeply spiritual dance form rooted in devotion (Bhakti). One interpretation of the name Bharatanatyam refers to the 4 core elements of the dance - Bhavam (expression), Ragam (melody), Talam (rhythm) and Natyam (dance). Bharatanatyam is a composite art form embracing the elements of nritta (pure dance), nritya (drama with dance) and natya (drama). In its present form, Bharatanatyam developed about 200 years ago in South India, with thematic and musical content developed by musicians of the Tanjore courts in the 18th and 19th century. The dance form is characterized by precise dynamic and rhythmic footwork, hand gestures and facial expressions. Dancers usually depict religious stories from epics and mythologies in praise of the Lord. 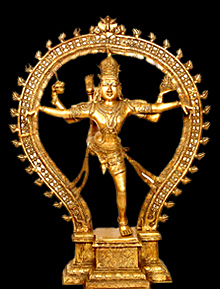 A signature of this art form is the expression of divinity in the dancer. To be a true exponent of the art, a dancer must have the ability to achieve spirituality through dance, dissolving their identity in the rhythm and the music, and experiencing Bhakti (devotion) from the soul.